We designed a Field Service Management (FSM) tool for handling tasks by mobile employees. The application puts a special emphasis on monitoring the activities of employees in the field and the time of reporting on their implementation. This allows you to verify the effectiveness of tasks carried out by mobile employees in the field. 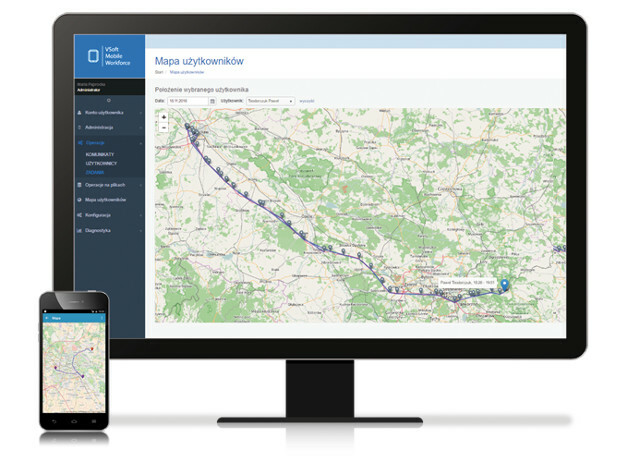 The solution allows you to plan the route of the employee, download online information about tasks and monitor the traveled route and GPS position of employees. The overriding goal of the solution is to increase the efficiency of mobile employees, which results in a reduction of company costs. Lack of control over employees in the field and no possibility of taking care of their safety. The person ordering field visits has a map preview of current employee positions at his/her disposal and can view the full routes made by each employee. It is not possible to automatically upload photos and documents that we want to attach to the final report of the field visit. The solution offers the ability to take photos of documents in the application, attach any attachments and send them as part of the field visit report. Reports from field work sent to people ordering field visits even with a few-day delay, which often affects the quality of the report. The ability to fill in information on the progress of the meeting on an ongoing basis. The scope of completed data depends on the settings made by the person who ordered the visit. Suboptimal planning of field visits and routes. This affects the dynamics of the activities carried out and the efficiency of mobile employees. The application has a calendar function. The application verifies the place of meetings on the map, optimizes the route and starts the navigation. Multi-page paper documentation. Customer data stored in such a way may be at risk. Sensitive data on debtors is securely stored in encrypted form on a mobile device and protected by a PIN. There is no current information about clients and the status of related matters. This is a problem in the case of high staff turnover and the need to train new people frequently in the team. All customer information is in one place and updates automatically in the application. What are the benefits of implementing our solution? Increasing the efficiency of field employees by 20% -30% by reducing office time (downloading and reporting tasks) and increasing time to work in the field. Saving of work of field team managers at the level of 10% in the field of data transfer and tasks for employees and settlement of their work. Faster (few minutes) passing information about the result of a field visit compared to using a traditional application on a laptop (several-dozen hours) or reporting via excel sheets and paper reports (several days). Increasing the correctness of submitted data on the report on the implementation of the task by verifying the scope of the entered data, their validation and hints (multiple-choice fields, dictionaries). Safety of personal and financial data by securing access and communication in a mobile solution. Full auditability of data access. Control over employees working in the field. Implementation of tasks in the field, real-time reports, monitoring of employee activities. Collecting orders, order processing, route planning, sales plans, reports. Full damage handling in-the-field, policy sales, access to customer data. Monitoring the implementation of investment works, mobile banking, simple banking for seniors. Servicing and communication with social media in real time. Counter status reporting in real time, failure reporting. The VSoft Mobile Workforce application is a Field Service Management (FSM) solution dedicated to debt collection companies, banks, insurance and leasing companies and other institutions. The solution can be used by field employees hired by the client, as well as the client can provide orders for outsourcing service to field employees. The administrator of your personal data is VSoft S.A. with its registered office in Krakow at ul. Puszkarska 7J. Personal data will be processed in order to answer the given question on the basis of art. 6 par. 1 point a) of Regulation (EU) No 2016/679 of the European Parliament and of the Council of 27 April 2016 on the protection of individuals with regard to the processing of personal data and on the free movement of such data and the repeal of Directive 95/46/EC. Data may be made available only to entities authorized under the law. The administrator will not transfer data to third countries. The data will be kept for the period necessary to contact the subject matter. You have the right to access your personal data and the right to rectify, delete, limit processing, right to object to processing, the right to transfer data, the right to withdraw consent. You have the right to lodge a complaint with the supervisory body, if you decide that the processing of personal data about you violates the provisions of the above Regulation. Providing data is voluntary, but necessary for the implementation of the above purposes. Your data will not be processed in an automated way, including in the form of profiling.